I am home with a bad cold today. I am reading Sidewalk Oracle by my favorite dream guide, Robert Moss. I fell asleep for a while. Images floated through my mind, but nothing stuck except when I awoke, the name or word Gaia was with me, the name for Planet Earth. Still in that liminal state, I did a Mysterious Night Vision scribble drawing of a figure who has emerged in my drawings before. 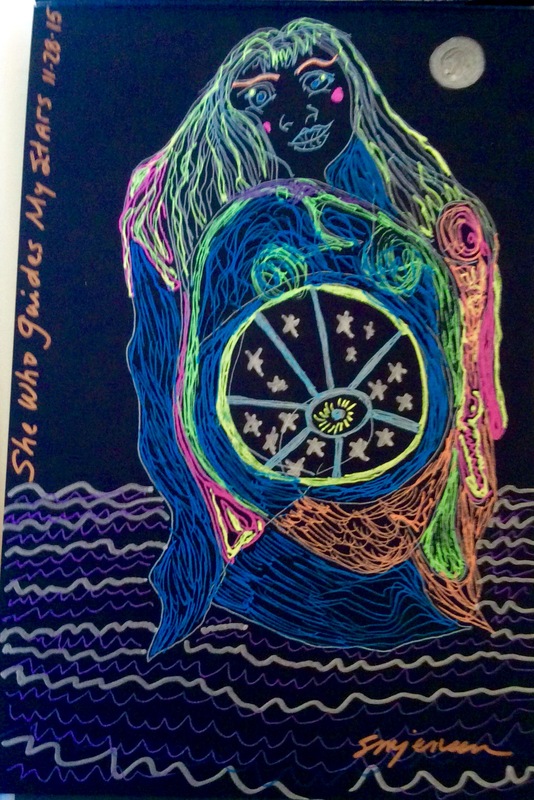 This one I called, “She Who Guides My Stars.” She floats just above the ocean waves, the full moon over her left shoulder. She is centered with a spinning wheel with stars shining between the spokes. Both hands are on it like a ship’s wheel – also like the Wheel of Fortune in Tarot. Both of her eyes are open, looking ahead, steering the ship of my body and life, spinning out my fate, guided by celestial navigation – the moon, the stars, and the changeable tides. 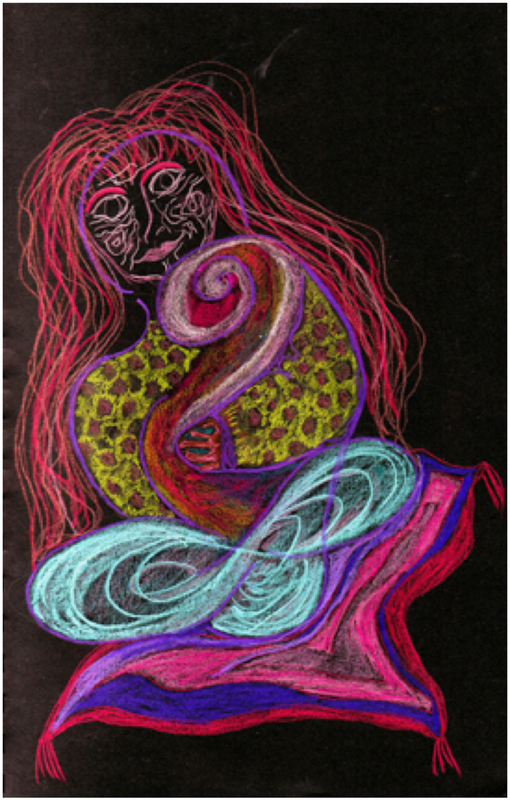 “Holding It Close” is another Night Vision drawing I did of my Celestial Navigator in 2010. Although I don’t do as much with the Tarot as I used to, those images are meaningful to me. I have worked on and off a building a Night Vision Tarot deck which I call a Dream Deck. I think this is one to add as a Wheel of Fortune, which refers to the creative cycles of life. The planet of “Wheel of Fortune” is Jupiter, the planet of opportunity, growth, success, and expansion. The lesson of the Wheel is always that there are ups and downs in life, but in my image, the Wheel s not just running free like an unmanned Ferris wheel; the goddess has both hands on the wheel, using it to steer the ship. It says that when I have been pushed in a new direction, I have to accept it and adapt. A good example is the cold I have right now, which is making sure I stay put and do nothing I had planned. Instead, I have been given hours to pursue new reading, new lines of thought. I have a few days to turn the compost of my mind to let the fertilizer reach those roots. As a major arcana card, the Wheel of Fortune appears at a pivotal time in my life where new options become possible. Through all the changes, I feel the center of stability within me; my Celestial Navigator is at the helm. I see her as carrying a shield and at the same time nurturing an embryo. The round shape at her belly works both ways! I love the marks on her face. They remind me of Tonaquah, and the Aboriginal women with beautiful painting on their faces.